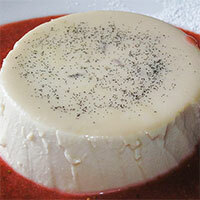 Panna Cotta, or cooked cream, is an Italian dessert. This dish is made by simmering together cream, milk and sugar. Usually it is served with fruit coulis, berries or chocolate sauce and caramel. In the northern regions of Italy, many sweeten this dessert with fruit or hazelnuts. Since it contains a lot of fat and calories, Panna Cotta is not at all diet friendly, and requires moderate portions. Preparing Panna Cotta is easy, and the possibility to add different ingredients at any given time makes it one of the best desserts there is (if we overlook the number of calories). Adding honey or even wine to it affects the texture in the best way possible. Fruit and berries on top make it perfect for every occasion, especially in summer. And for those of you who don’t actually have a sweet tooth, there is also a version of this dish which involves salt and other spices. The calories in Panna Cotta per 89.5g(1 plate) is 203 calories. Panna Cotta is calculated to be 227Cal per 100 grams making 80Cal equivalent to 35.24g with 20.51g of mostly carbohydrates、12.64g of fat、2.47g of protein in 89.5g while being rich in vitamins and minerals such as Vitamin A Retinol Equivalent and Molybdenum.